"This is your home now," everyone tells Sieta, but Sieta can't help feeling sad when she thinks back to her previous home over the mountains, before her mother and father died of illness and she came to live with Aunty. One day, Sieta's teacher takes the children to see the orphan elephants in a nearby elephant park. The moment Sieta sees the baby elephant Satara, and he looks soulfully at her, each recognises the sadness in the other. How Satara helps Sieta to forget her sadness and start living life afresh is sensitively told and warmly illustrated in a book which children will love both for its emotional impact and for its endearing portrayal of elephants. LESLEY BEAKE is a multi-award-winning writer for children and young adults. Her international awards include, for Song of Be, a Children's Book of Note and the Best Book for Young Adults by the ALA. Outside South Africa her books have been published in ten countries. Of the 45 books published in South Africa, one has been translated into thirteen African languages. 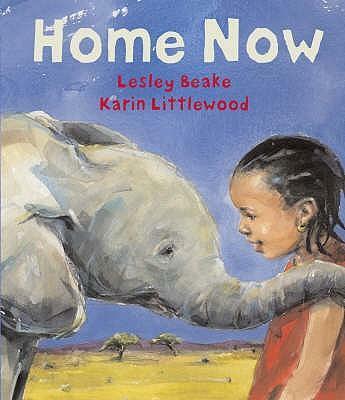 Her first book for Frances Lincoln was the highly-acclaimed picture book Home Now, illustrated by Karin Littlewood. She lives in Simon's Town, near Cape Town, South Africa. Karin Littlewood studied Graphic Design at the University of Northumbria, followed by an MA in illustration at Manchester Metropolitan University. She has worked in editorial, packaging, design and advertising, as well as publishing. Her work has been nominated for the Kate Greenaway Medal three times.